MANHATTAN, Kan. — A recently invaded tick species known as the long-horned tick could establish itself in wide swathes of North America — if they are transported accidentally. This prediction was published in a new study in Nature's Scientific Reports by Ram Raghavan, assistant professor at the Kansas State University College of Veterinary Medicine, and his international team of collaborators. 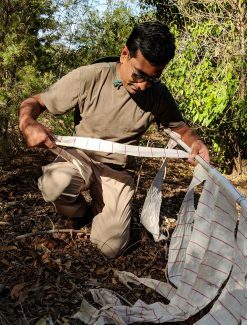 "The long-horned tick is also known as the east Asian tick, in Australia as the bush tick and in New Zealand as the cattle tick," said Raghavan, a spatial epidemiologist. "This species of tick is native to Japan, China, Primorsky Krai region of eastern Russia and Korea; and it is well-established as an invasive species in Australia, New Zealand and on several Pacific Islands." 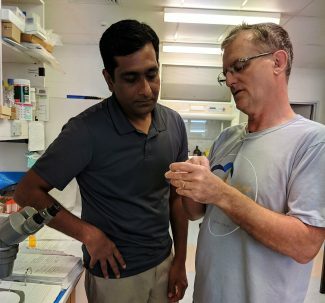 In some of these countries, Australia and New Zealand in particular, Raghavan said this tick is implicated in the transmission of theileriosis to cattle — costing several millions of dollars each year — and in other places they are known to transmit severe fever thrombocytopenia virus to humans. Raghavan pointed out widespread concerns that the tick — Haemaphysalis longicornis — will successfully establish invasive populations in the U.S. and spread broadly from where it has been currently found. "Our primary focus in this study was to predict where this tick could establish in North America, and to do that as robustly as possible considering all the caveats in spatial distribution modeling," Raghavan said. Data for modeling the potential spatial distribution for this tick species was provided by multiple institutions, collected from the species' native distribution range. This tick species has an ability to reproduce without males and to spread to new places and establish under rather diverse climatic conditions. "About 1983, H. longicornis had spread from northwestern New South Wales and/or southeastern Queensland across Australia to the coastal areas near Perth in Western Australia," said Steve Barker, parasitologist and a leading expert on Australian ticks at the University of Queensland. "Such an invasion in the U.S. would carry a significant economic burden and potential human suffering, especially since this tick is capable of transmitting a variety of pathogens such as those that cause Lyme disease and others," said Barker, who is one of 10 co-authors of the article, "Potential Spatial Distribution of the Newly Introduced Long-horned Tick, Haemaphysalis longicornis in North America." Among other collaborators are researchers from the Walter Reed Army Institutes of Research, University of Kansas and institutions in Japan, Australia and New Zealand. Raghavan said the best-fitting spatial distribution models in his research had indicated a broad potential distribution for this species. The researchers' model accurately predicted all of the areas in which this invaded tick has already been found in the U.S.
"By our model, we have identified vast areas of North America, particularly the southeastern U.S., the West Coast and broad areas of the northwestern U.S., as well as central and southern Mexico, as climatically suitable for establishment of this species," Raghavan said. Another concern arises from the ability of these ticks to travel as parasites on different mammals.